NEW YORK, Oct 15 2013 (IPS) - Two years after they were awarded 18 billion dollars by an Ecuadorian court for environmental damage caused by Chevron in the Amazonian rainforest, a group of indigenous villagers and their U.S. lawyer went on trial Tuesday in New York, accused by the oil company of bribery and racketeering. Chevron was found liable in 2011 for an ecological catastrophe caused by pollution released in the 1970s and 1980s by Texaco, which Chevron acquired in 2001 and for which they agreed to assume legal obligations. Chevron has refused to pay the penalty. 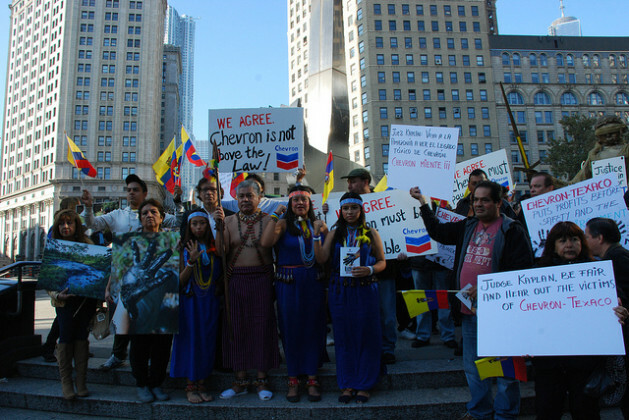 Because Chevron has no assets in Ecuador, the plaintiffs have attempted to collect the fine abroad. The New York suit, filed under the RICO statute, a strategy made famous during Mafia prosecutions in the 1970s, seeks to block enforcement of the 2011 decision in U.S. courts, where Chevron maintains ample reserves to foot the bill. The complaint claims the lawyer, Steven Donziger, and a group of Ecuadorians representing the 30,000 original Amazonian plaintiffs attempted to persuade and corrupt a series of Ecuadorian judges who heard the case in an attempt to extort Chevron. Donziger and the Ecuadorian defendants deny any wrongdoing and assert the lawsuit is another expensive legal distraction that the 230-billion-dollar corporation can afford to tack onto what has become a 20-year saga of litigation. Outside the courthouse, Ecuadorians and their supporters gathered to protest the case. Demonstrators chanted and held photographs depicting shiny, blackened earth, open runoff pits and frail jungle residents who they said were dying from cancers that resulted from the estimated 18 million gallons of crude oil and 18 billion gallons of toxic wastewater that was leaked or illegally pumped into pristine jungle ecosystems around the Lago Agrio field the northwest of the country. “We’re here in front of the courts against this large corporation,” said one of the defendants, Javier Piaguaje, a Secoya Indian who lives along the heavily polluted and now-ironically named “Aguarico” River. Dressed in traditional Secoya garb, Piaguaje told the crowd the lasting effects of the spill were ravaging his community. “Every day, family members and loved ones are sickened because of the contamination,” said Piaguaje. “We’re here to show what’s really going on in the Amazon,” he added, before turning to enter the courthouse and mount his defence. The judge in the case, Lewis Kaplan, has long been a thorn in the side of indigenous plaintiffs. Earlier this month, Kaplan decided Donziger and his co-defendents were not entitled to a trial by jury. “This trial is a travesty of justice,” said Paul Paz y Miño of Amazon Watch, an environmental justice group that assists the Ecuadorian claim. “Chevron has spent years to have a trial where the original plaintiffs are not allowed to discuss the evidence,” Paz y Miño told IPS. “There is absolutely no evidence of fraud on behalf of the plaintiff,” he added. A spokesperson for the defendants in the New York case, Han Shan, told IPS the lawsuit took a lot of chutzpah on the part of Chevron. “They’ve done a great job of media and political jujitsu in taking things that we were alleging, Chevron being totally corrupt, putting pressure on judges, bribery, trying to entrap people, using dirty contracters and said that we did it,” said Shan. In 2009, Diego Borja, a Chevron contractor in Ecuador, was caught trying to entrap the presiding judge, Juan Nunez, by videotaping himself offering Nunez a bribe. Chevron has since paid for Borja to move to the United States and supplies him with a monthly stipend. The Chevron media relations website was down for maintenance at the time of this article and IPS was unable to reach the company for comment. Donziger has said his quotes were taken out of context. Judge Kaplan has already decided in favour of Chevron once. In March 2011, Kaplan issued a global injunction that blocked enforcement of the Ecuadorian judgment, effectively kneecapping indigenous claims. In January 2012, however, the 2nd U.S. Circuit Court of Appeals in New York overturned the injunction, which opened the door once more for the original plaintiffs to enforce the 18-billion-dollar decision in U.S. courts. That decision led Chevron team of over 100 lawyers to cobble together a last ditch defence strategy in form of the RICO suit, which they worked hard to have heard in Kaplan’s courtroom. Shan isn’t optimistic about Kaplan presiding over the case. But should Kaplan rule against the indigenous community and issue a global injunction once more, Shan is confident the 2nd Circuit will strike it down. “The 2nd Circuit has been clear that the U.S. District Court is not an appellate court for the Ecuadorian judiciary and there’s absolutely no jurisdiction for that kind of injunction,” said Shan.